Revealed: Why Aussies Have Given Online Grocery Shopping The BIG Thumbs Down! As revealed on B&T today, Amazon is the latest competitor to enter the hotly contested grocery market. However, if a new study into the grocery shopping habits of Aussies is to be believed then the facts are we still prefer a trip to Coles and Woolies. According to the latest study by Roy Morgan Research, only three per cent of Australians did their grocery shopping online in any given four-week period in the 12 months to June 2015. That was up from 1.4 per cent the year previous. Not that we’ve dismissed the concept entirely, with some 26 per cent agreeing that they would “consider doing some of my grocery shopping on the internet in the next 12 months”. And when it comes to the most popular grocery home delivery service it’s a badly needed win for Woolies. Some 237,000 Aussies say they “mainly or sometimes” get their groceries home delivered by Woolworths. 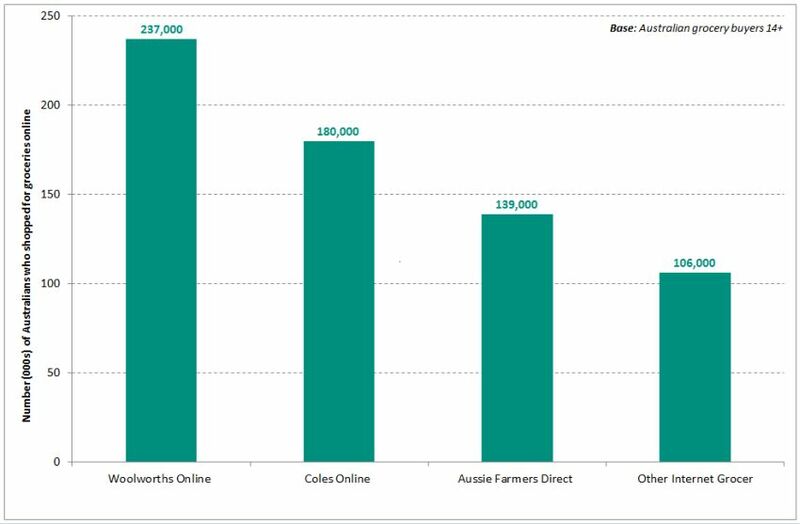 Coles laid claimed to 180,000 regular users and Aussie Farmers Direct was third with 140,000. The rest was made-up by smaller players (who namely delivered dry goods, not fresh) such as GroceryRun, Indo-Asian Grocery Store and a multitude of smaller players. This group represented 106,000 local users. Commenting on the study, Roy Morgan CEO, Michele Levine, said: “The great disparity between the proportion of grocery buyers who say they’d consider doing their supermarket shopping online in the next 12 months, and the proportion who actually go on to do so, speaks volumes about the state of online grocery shopping in Australia. While consumers are clearly not opposed to the idea, they seem to be having trouble putting it into practice. “As our latest State of the Nation report reveals, there were some significant shifts in Australian retail last financial year, with supermarkets and other grocery retailers seeing their fair share of change. No doubt, the coming 12 months will bring even more developments. Whether a move to online grocery shopping is one of them remains to be seen,” Levine said.